Insider tells E! News that the former commander in chief took Bieber saying "F--k Bill Clinton" in jest; teen tweeted that the prez was a "#greatguy"
Justin Bieber could teach a master class in damage control. After getting caught on video urinating in a mop bucket and saying "F--k Bill Clinton" while in the act, the 19-year-old actually spoke to the former U.S. president today and apologized for his actions, a source close to the situation confirms to E! News. And it sounds as if Clinton was really cool about it. The insider tells us that the erstwhile commander in chief took Bieber's slam in jest, saying something along the lines of, "If that is the worst thing you have ever done, all is well." And that had to have felt good to hear, considering the rough time Bieber has been having staying out of headline-making situations lately. "@billclinton thanks for taking the time to talk Mr. President. Your words meant alot. #greatguy," he tweeted earlier today after their talk. 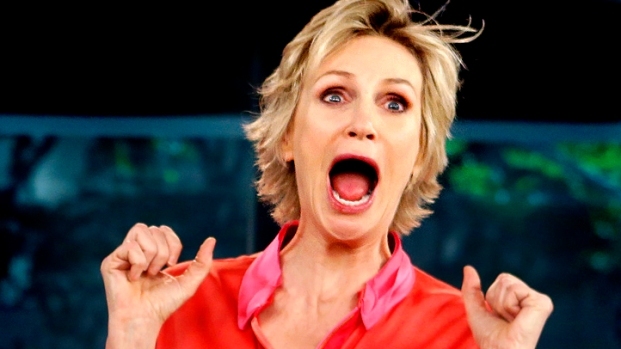 Jane Lynch will host,"Hollywood Game Night" a new game show where everyday people get to party with celebrities. The show premieres July 11 on NBC. We're also told that Bieber told the statesman and activist that if there was anything he could do for the Clinton Global Initiative, he would love to help. Clinton, in turn, told the pop singer to focus on the good that he can do for the world--and to keep an eye on his friends (one of whom purportedly leaked the video in question). They say you can't make an omelet without breaking a few eggs, and at least the Biebs was left with an omelet today. He also came under fire from Chicago Blackhawks fans after both standing on the team's logo in the Blackhawks locker room and getting a little too cozy with the Stanley Cup for their taste while posing for pics with the NHL's highest honor. But the Blackhawks have no issue with the Biebs, according to a statement released later by the team. "As frequently happens with guests into our room, Justin inadvertantly stepped on the team logo on the floor but moved off quickly once immediately reminded," said Brandon Faber, senior director of Media &Community Relations. "He was apologetic and understanding of the tradition but continued to take photos with the Cup and some young fans. He was extremely genuine and kind with his time. We appreciate his enthusiasm towards hockey and wish him well with the remainder of his tour."